The tourists fell just 39 short of a mammoth 490-run target on the fifth and final day of the Gabba Test, led by a magnificent 137 from Asad Shafiq. Pakistan say they have the momentum heading into the Boxing Day Melbourne Test after giving Australia a mighty fright during an epic run-chase in the opening clash of the series. Steve Smith was a relieved captain as his Australia team fell over the line after the last five Pakistan wickets piled on 230 runs to get within sight of a world-record Test run chase. The gruelling 145-over fourth innings has taken its toll on the Australian bowlers with selectors adding bowling all-rounder Hilton Cartwright to the squad as a precaution while their recovery is assessed. The tourists’ batting coach, Grant Flower, said the Australians can expect another hard slog on an abrasive drop-in Melbourne Cricket Ground wicket in expected sweltering conditions as Pakistan fight to level the three-match series. “The confidence they have gained since that last innings and that momentum will definitely help carry them on into this Test,” former Zimbabwean Test batsman Flower said. 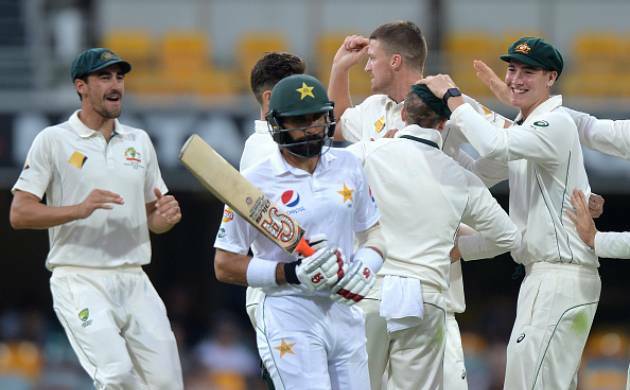 Australia dominated the first day-night Brisbane Test up until late on the fourth day, when signs of anxiety crept in as Pakistan edged closer to a miraculous victory before Shafiq was dismissed. “I saw a lot of very nervous campers all of a sudden for the first time,” Pakistan assistant coach Steve Rixon said. Pakistan have lost their last 10 Tests in Australia and last won at the MCG in 1981 in the era of Imran Khan, Javed Miandad and Zaheer Abbas. The Australians are confident crack pace pair Mitchell Starc and Josh Hazlewood will back up to bowl at the showpiece event despite each sending down 56 overs in the Brisbane heat with just a week’s recuperation. “They’ll be sore, for sure, but it depends on how significant those little things are and the risks associated with it,” team sports medicine manager Alex Kountouris said. Zimbabwe-born Cartwright, who was recently included in the Chappell-Hadlee ODI squad to face New Zealand but did not play, has averaged 44.50 across 16 first-class matches. But his 15 first-class wickets have come at an undistinguished 41.93, and he has only four wickets at 74.75 in the current Sheffield Shield campaign. The selectors’ desire for a batting all-rounder to take a place in the top six means the incumbent number six, Nic Maddinson, could face the axe after his three Test innings of 0, 1 and 4. Team vice-captain David Warner is also overdue and has not posted a Test century since his 122 against the West Indies in Sydney in January for an average of 35 this year, well below his career average of 47.58. Australia (from): Matt Renshaw, David Warner, Usman Khawaja, Steve Smith (capt), Peter Handscomb, Nic Maddinson, Hilton Cartwright, Matthew Wade, Mitchell Starc, Josh Hazlewood, Nathan Lyon, Jackson Bird, Chadd Sayers. Pakistan (from) - Azhar Ali, Sami Aslam, Babar Azam, Younis Khan, Misbah-ul-Haq (capt), Asad Shafiq, Sarfraz Ahmed, Wahab Riaz, Yasir Shah, Mohammad Amir, Rahat Ali, Sohail Khan, Imran Khan.